Edward Kollada has joined The Bensman Group as the Managing Director of Retirement Plans. In his new position, Ed assists Bensman clients with plan design, maximizing funding capabilities and implementing fiduciary and investment due diligence best practices within their 401k and profit-sharing plans. Ed is a Certified Public Accountant (CPA) and a Certified Financial Planner (CFP) with more than 25 years experience in financial services. Before joining The Bensman Group, he held senior level positions with American National Bank, Lehman Brothers, American Chartered Bank and First Midwest Bank, specializing in providing personal and business advisory services to growing middle-market companies and their senior management teams. Ed says he enjoys dealing with the complex world of employer-sponsored retirement plans and helping employers to understand and navigate that world. The regulatory environment poses particular challenges. In addition to advising them on regulatory issues, he works with plan sponsors to decide what investment choices to offer within the plan. Once a diversified investment lineup is chosen, the investments are reviewed quarterly to be certain they are in line with the plan’s investment policy statement (IPS). Ed also helps with the educational aspects of the plan. “We work with the plan sponsor to develop an educational plan that helps employees understand their 401k plans and fits into the work environment of that employer,” he says. His work is satisfying because it has a positive impact on both employers and employees. “Plan sponsors provide an important benefit to their employees, and I want to help the sponsors enhance that benefit for employees while making the plan work best for their business,” he says. Ed is part of the Retirement Plan Advisory Group (RPAG), an organization of 700 advisers representing 300 advisory firms that provides a variety of tools and resources to assist in servicing retirement plans ranging from $1 million to $250 million in assets. He utilizes those resources to help clients of The Bensman Group. A graduate of Indiana University with a bachelor of science degree, Ed also holds an MBA in Finance from DePaul University. He holds the following licenses: Series 7 General Securities Representative, Series 63 Uniform Securities Agent State Law, and Series 65 Uniform Investment Adviser Law. 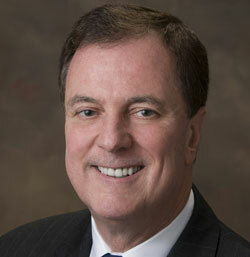 He also is a member of the American Institute of Certified Public Accountants (AICPA) and the Illinois CPA Society. Ed lives in Deerfield with his sons, Matt and Mike. You can contact Ed at 847-572-0806 or ekollada@bensman.com.